Recorded over four different sessions helmed by four different GRAMMY-winning producers in four different cities, ‘Almost Home’ recounts the band’s remarkable journey, primarily through original songs written for them by an outstanding collection of artists including Valerie June, the North Mississippi Allstars, Phil Cook, John Leventhal, Marc Cohn, and Ruthie Foster among others. The record is the band’s first in three years, following on the heels of 2014’s ‘Talkin’ Christmas!’ with Taj Mahal and their 2013 collaboration with Bon Iver’s Justin Vernon, ‘I’ll Find A Way,’ and it sees them picking up right where they left off, blending the sacred and secular, the traditional and innovative, the past and present. ‘Almost Home’ grew out of the recognition that the band’s original lineup is down to just two remaining survivors: long-time group leader Clarence Fountain and current leader Jimmy Carter. Both men were born in Alabama during the Great Depression, and while Carter is still active and regularly touring with the group, Fountain’s health precludes him from traveling much these days, though he does appear on the album. So Driebe went on a pilgrimage with a film crew in tow, recording wide-ranging interviews with Fountain and Carter at their homes in Baton Rouge and Birmingham, pressing deep into their memories of their improbable route to success and the changing, sometimes-hostile world they had to navigate along the way. The focus was less on capturing a biographical account of events and more on probing the emotional side of their journey, hoping to understand what it felt like to walk such a winding and eventful road. The interviews were then distilled down into 30-minute videos and shared with a variety of songwriters who were invited to channel Carter and Fountain’s words and reminiscences into song. With nearly 50 tracks submitted for consideration, the producers and the band had a sea of material to sift through. They were searching for more than just great songs, though. The music needed to speak directly and authentically to the Blind Boys’ soul. The result is ‘Almost Home,’ a 12-track collection that captures the band’s singular spirit and pulls off the masterful feat of looking backwards while still sounding as vital and modern as ever. The album opens with the captivating “Stay On The Gospel Side,” which sets the stage perfectly as it traces Fountain’s roots all the way back to childhood and recounts the band’s insistence on remaining true to their origins. Written by John Leventhal and Marc Cohn (with an additional credit to Fountain, since the title came from his exact words), the track is one of a trio of songs produced by Leventhal (Rosanne Cash, William Bell) and recorded in New York City, and it showcases the stunning range of joy and pain contained in the group’s beautifully weathered voices. On “Pray For Peace,” which is the Blind Boys’ version of a song submitted by the North Mississippi Allstars and recorded in Nashville with at the studio of Vance Powell (Chris Stapleton, Jack White), the group offers up a foot-stomping, electrifying gospel blues for our troubled times. Meanwhile, the Cris Jacobs’-penned “I Kept On Walking,” recorded in Muscle Shoals with Los Lobos’ Steve Berlin (Faith No More, Buckwheat Zydeco) producing, is a rave-up about persistence and resilience in the face of struggle and doubt, and the folky “Train Fare,” written by Valerie June and recorded in Seattle with long-time Blind Boys producer Chris Goldsmith (Charlie Musselwhite, Ben Harper), looks back on all the good works of the band’s career as their ticket to the afterlife. Goldsmith also nodded to his previous recordings with the band by adding two gorgeous covers – a soulful take on Bob Dylan’s “I Shall Be Released” and a chipper version of Billy Joe Shaver’s “Live Forever” – both of which look to brighter days ahead in a world beyond our own. Given the age of the surviving original members, it’s not hard to hear the subtext of the album. In lines like “my work is done and I’m finally going home to see my maker,” they acknowledge that they’re closer to the end than the beginning. But rather than resting on their laurels, the band is adding a new chapter to their legacy, creating some of the finest work of their career as they solidify their place not just in musical history, but in the very fabric of American culture. 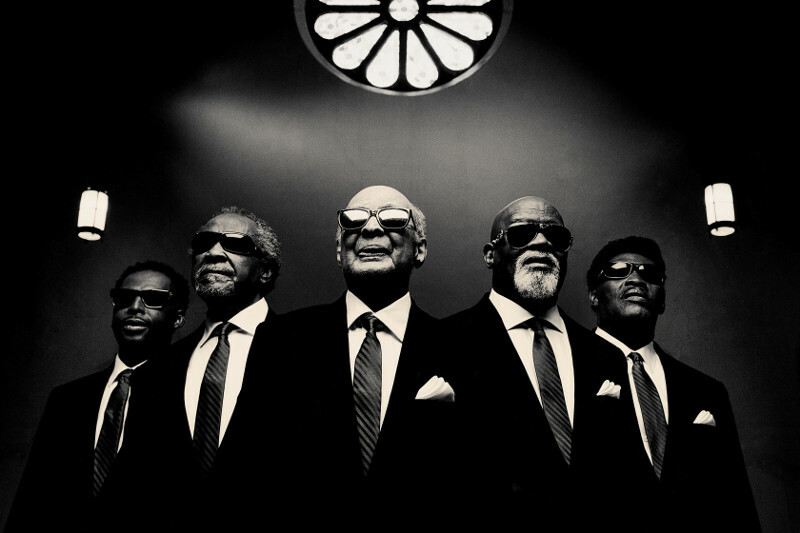 The original members may be ‘Almost Home,’ but it’s clear the Blind Boys intend to keep on singing, spreading peace, joy, and love until the very last note.